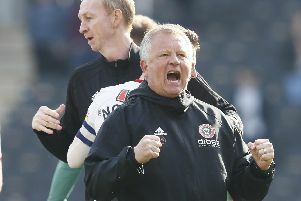 Chris Wilder says Sheffield United are still to reach their full potential despite securing their fourth win in five games on Tuesday evening. Harry Chapman was the goalscoring hero as United overcame a spirited, 10-man Bristol Rovers at Bramall Lane, sending Wilder’s side into the top six after 10 games of the League One season. Despite Rovers being reduced to ten men, after Jermaine Easter was sent off after a mid-air collision with Jack O’Connell, they battled hard for an equaliser and both Daniel Lafferty and John Fleck were forced to clear off their own goal line in the dying moments. And Wilder, who has long maintained that his side should be judged after 10 games, said: “The players are still learning about me. “My only complaint was that we didn’t really go for the kill when they went down to 10 men. that and then look for the overload. “But we’re still learning about each other and what we want, so that’s understandable. There are still things to work on and still areas where we can improve. “But, even at the start, we always maintained that we weren’t far away.